I have spent a lot of time thinking about fear these past few months, especially after watching my father pass away right in front of me with nothing I could do to stop it. Was I afraid of dying? Was he? Surely he had thought about it, knowing that it was a possible outcome of his Cancer. Fear is a very powerful emotion. It can stop us from achieving our true potential. I was afraid of the water. Since taking on the sport of Triathlon I have learned this. The realization came to me a few weeks ago when swimming the Alcatraz Sharkfest Swim. Without hesitation or fear, I jumped into the icy cold San Francisco Harbor with a smile and started making my way to the shore, anticipating a hot cup of coffee at the finish and hopefully a big breakfast. 2 years ago I would have never attempted such a feat. For all of my life (until now) I have been scared of the water, be it the deep end of a pool or a lake. If I couldn’t touch the bottom, I wasn’t into it. Why? Was I traumatized as a kid? My parents were awesome, they had me in swim lessons at a young age so it’s not like I couldn’t tread water. Looking back, I think my height played a big role in my fear. I hung around really tall swimmers who would venture into the deep and play water football. Knowing I couldn’t touch the bottom I would watch from the sidelines. These were my summers growing up and after awhile I had no interest in even going to the local pool. Ironically, late in High School I used to love going to a place called Difficult Run and cliff diving into the rapids or riding the waterfalls. We also went to an abandoned bridge called ‘Party Bridge’ and jumped off its 40 foot ledge often. These activities might not be considered ’swimming’ though. 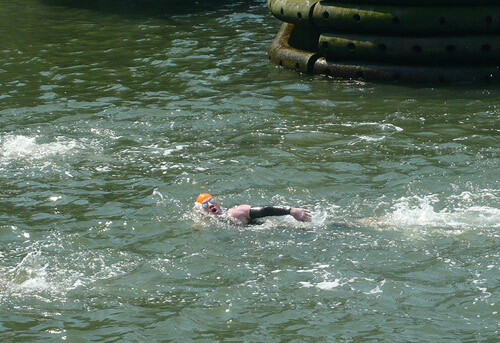 In 2008 when I took up running, it wasn’t long before I had friends saying “Baker, you should do a triathlon, you are good at running and biking, you just need to get swimming!” I wanted very badly to do a triathlon, but I feared swimming. Luckily, one of my best friends is really stubborn and pretty much ordered me into his buildings pool one night after work, telling me he would re-teach me how to swim. Todd went over the mechanics of swimming and taught me freestyle. At first I would swim 2 laps, then rest before setting off for 2 more. 2 weeks later I could do 10 laps before resting, and so forth. Progress was being made. 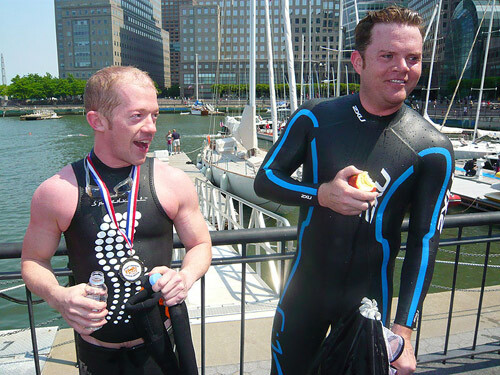 Then, he told me we were swimming a 1.6 Mile race down the Hudson River in May. Things got real and I felt my fear rise again. We conquered that race and many more after it. Swimming in the Hudson doesn’t even get me nervous at all anymore. 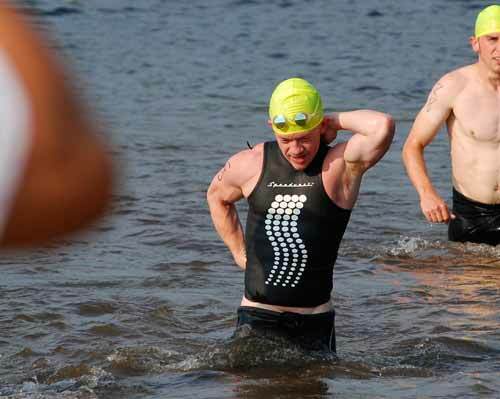 Soon after that race I completed my first triathlon and never looked back. I now look forward to swimming and the smell of chlorine gets me excited. My fear turned to love. So I ask you readers, what are you afraid of? What are you going to do about it?